Mission Statement: The Bowie Fire Department, through the dedicated efforts of its members, provides fire education and prevention; fire suppression and rescue; and emergency medical services. These services meet or exceed the expectations of the public and private agencies in order to enhance the quality of life in the City of Bowie. The Bowie Volunteer Fire Department is composed of three fire stations. Our stations are located in "Old Bowie/Huntington", "Freestate/450", and "Pointer Ridge/Mitchellville". From these three stations, we have responded to close to 11,000 calls for help last year. These calls for help included a gentleman having chest pains, an elderly citizen who was feeling ill, a family whose house caught on fire, a student who fell playing basketball at school, a car that ran off the road, and a resident that locked himself out of his home, just to name a few. The Bowie Volunteer Fire Department and Rescue Squad is made up of approximately 80 active members. Our volunteer members come mainly from the Bowie community. A large percentage of our members live in Bowie. In fact, most of our members grew up in the Bowie area. Our remaining members live in other neighborhoods, but have found that the Bowie area is a community worth serving. Members come from all walks of life. They work a regular workweek as company managers, career firefighters, engineers, teachers, health care professionals, carpenters, police officers, mechanics, government employees, secretaries, computer programmers, etc. But once they finish their "paying jobs", they dedicate their free time to helping their neighbors in times of need. As volunteers, our members receive no payment for this job. Our "payment" is the satisfaction that we were able to help. Our members are trained in fire fighting and emergency medical procedures. The basic fire fighting and emergency medical technician courses consist of 260 hours. 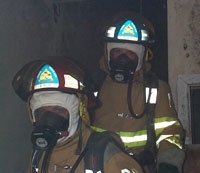 After our basic training, members take advanced courses in fire fighting techniques, apparatus operation, leadership, management, instruction, hazardous materials, and emergency medicine. Each of these additional courses is approximately 80+ hours. The courses that our members take are given on evenings and weekends. Each member has an average of over 300+ hours of certified state and national training. Volunteers staff each of the three stations primarily in the evenings, early mornings, all weekends, and holidays. Our stations are staffed with several county fire fighters and supplemented with volunteers. Currently, the county has assigned four fire fighters/EMTs to a 24-hour shift at each of the three stations. By having county personnel in the stations during the day, it allows our members to work their "paying jobs" and still insure that the Bowie area is protected. (Volunteers serve the community for 70% of the hours each week. The additional 30% of the hours is staffed by a combination of volunteers and county personnel.) It is estimated that volunteer firefighters and emergency medical technicians save the Bowie community over $3 million in salaries each year due to their volunteer participation. 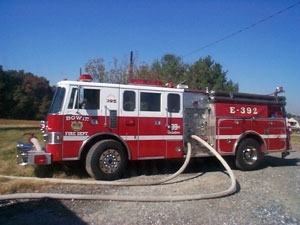 The Bowie Volunteer Fire Department and Rescue Squad operates six engines, two tower ladders, one ladder truck, two brush units, a water tanker truck, five command vehicles, a lighting unit, and four ambulances. The funds for new engines and equipment are generated from donations by citizens in the community and funding from the City of Bowie. With the community and city's support, we are able to provide many non-emergency services. Some of the non-emergency services that we provide include teaching CPR and first aid classes, school visits, fire prevention education, free smoke detectors for those who cannot afford them, Bowie's Annual Fire Prevention Day and Open House, free home fire safety inspections, and station tours. This site has been viewed 929,673 times.